We have been dealing with some Lenovo Yoga 13 ultrabooks recently and the wireless cards keep disconnecting and then refuse to reconnect. After reading on the Lenovo forums, this appears to be widespread on these models. Below are fixes we have compiled from different people that will fix the issue. 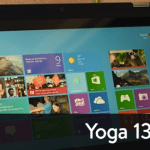 We now have the Yoga 13 working properly. Bring up the device manager by searching “device manager” from the charms menu under settings. Click on network adapters in the device manager. Right click on “Realtek RTL8723A wireless …” under network adapters. Click on properties. In the properties box click on the advanced pane. Right click on the network adapter, go to properties. To see more solutions and ideas, please check out the forum thread on the Yoga 13 Wifi Issues where a lot of these came from. Or if you have additional fixes, please post them below in the comments. Thank you! I’ve seen this issue with ASUS ZenBooks as well. Maybe this will help. Please let us know if the above helps at all. We can update the post. After that I needed to repeat the step #2 above for Wifi config. Disable the “RunSwUDB” service: Charms, Search for “local services” in Settings, right-mouse on RunSwUSB and select Properties, Stop and set its Startup Type to Disabled. why does the mouse pointer flicker affect it?